B) Use the 'Search' box to the Top right of your screen. If you don't find the Tow Bar you require please just give us a call or drop us an email and we will endeavor to meet your requirements. We stock over 500 different part numbers. At AutoFastFit, we pride ourselves in only keeping the best brands with OE specifications, and brands that we trust. Auto Fast fit is a family run business established over 50 year ago. We have been selling and fitting tow bars for many years and take pride in only offering the premium quality at discounted prices. We keep various brands, which will allow you to choose by price or preferred brand. Quality is guaranteed at autofastfit.ie. Only approved products are listed, which will not affect the cars manufacturers warranty. Browse through our large range of car products. Auto Fast Fit have been using Bosal and Steinhof for many years. With our commitment to quality and customer satisfaction, Our relationship with Bosal and Steinhof has stood the test of time. Bosal is a leading manufacturer of tow bar systems, Established in 1923 in Alkmaar, the Bosal Group is Dutch registered, headquartered in Lummen, Belgium. The annual turnover in 2009 was in excess of € 590 million. The Bosal Group employs over 5,400 people in 41 manufacturing plants and 12 distribution centres. Bosal´s customer base includes all major car manufacturers worldwide as well as a variety of leading industrial conglomerates. With fixed tow bars, the tow ball is integral with the car and cannot be removed without tools. Fixed tow bars are especially designed for frequent use. They are guaranteed to function through a long and demanding life. This towbar is suitable for heavy-duty towing and is therefore ideal for commercial and off-road vehicles. The design is compatible with two- and four- hole fixings (height adjustable) depending on the vehicle type. 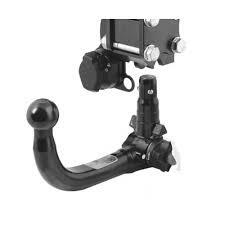 The detachable style tow bar is now becoming more popular as customers are requiring a neater job when not in use. Once the detachable neck is removed the remainder of the bar is invisible, leaving the car with its original look. AutoFastFit have been selling and fitting Steinhof Tow Bars for the past 7 years. The STEINHOF company offers high quality tow bars for cars and light commercials. As a company there main goal is the constant increase of the quality of production, which is confirmed, among other things, by the ISO 9001:2008 quality certificate. STEINHOF guarantees the highest durability of every product, which can be seen by our Customer satisfaction. Auto Fast Fit believe that the our manufacturers of tow bars aspire to make their products to be exceptional when it comes to the durability of each of the products, but also make sure they are easy to install and use. One of the main components of Steinhof's company development policy is to care about production refinement and adaptation of productive norms to requirements and standards set by vehicles producers and international law regulations. The Company produces basing on Quality Management System ISO 9001:2008 confirmed by TUV CERT and successively enlarges the quantity of references with ECE-R90 homologation.